Today I had a conversation with two Jehovah’s Witness ladies, and we spoke a bit about their translation. 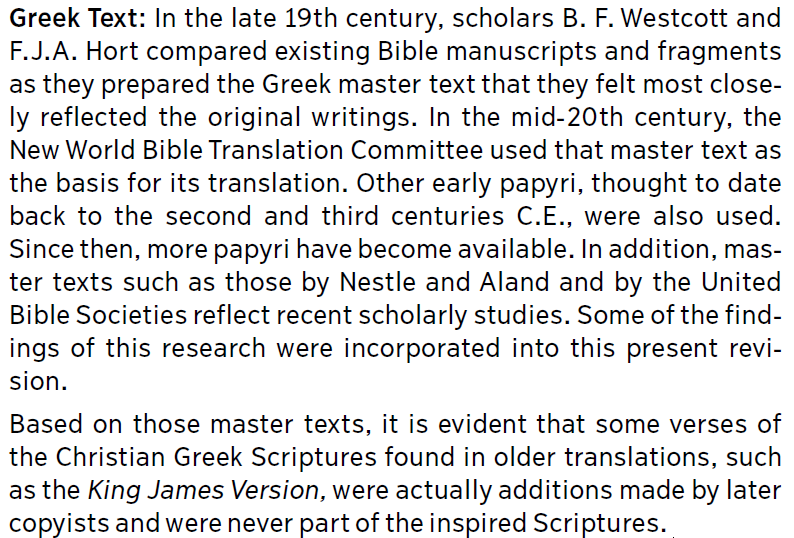 Interestingly, they told me that “their translation come via the oldest manuscripts.” To which I replied that their translation actually comes via the Wescott and Hort text from the 1800’s, as noted above from the Witnesses own material. But, more importantly, the final partial paragraph of the screen shot above mildly criticizes the King James Version for “additions made later by copyists and were never part of the inspired Scriptures.” This is another topic which we addressed today in our conversation. It’s shocking to see a statement such as this via the WTB&TS, especially when one considers the absolute deception on the Societies part regarding many of the Christological texts in their 2013 revision. 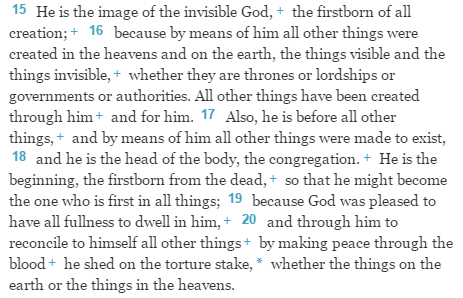 Consider the following: in Philippians 2.9, the NWT inserts the term “other” (which is not found in the Greek), and proclaims that Jesus was “given the name above every other name.” In the 1984 edition of the NWT, this term (other) was bracketed to allow the reader to know that this was an insertion into the text – but now the bracket has been removed, thus implying that Jesus does not possess the divine name of YHWH. But, there’s more. In Colossians chapter 1, we see the same intentional and deceitful additions taking place, with the insertion of the term “other” in verse 16 (“all other things – “other” not in the Greek text), verse 17 (“all other thing” (x2) – “other” not in the Greek text), verse 20 (“all other things” – “other” not in the Greek text), and by doing so, they present to their readers a temporal, created Jesus, rather than the very one who created ALL THINGS (as the Greek reads) in every realm of creation – both heaven and earth. In short, if it’s a created thing in heaven or earth, Jesus created it, yet, the Witnesses intentionally insert the term “other” to counteract this Biblical teaching. Moreover, the 1984 edition had these words bracketed, and once again, the 2013 edition removes the brackets to apparently give the impression that these are not insertions/additions, but rather, the original readings. Finally, in Titus 2.13, the 2013 revision of the NWT reads as follows, “while we wait for the happy hope and glorious manifestation of the great God and of our Savior, Jesus Christ” (Titus 2.13, NWT, 2013 Revision). Please note that the text states “great God and of our Savor, Jesus Christ.” This in Greek is known as a Granville Sharp construction, and because of this construction, it is impossible that two persons are in view in the text. Rather, the Greek rendering of this verse reads “great God and Savor, Jesus Christ,” thus attributing full deity to the Son, who is the “great God.” Notice how the addition “of our” in the NWT divides God and Savior, this implying that the Father is God, and Jesus is Savior. But, the Greek text does not read this way, and once again we see how the NWT adds to the text of Scripture in an attempt to remove the absolute divinity of Christ from the text.